Sunday, March 31: Opening Day! NEW items arrived Monday night come SHOP!! Items WITHOUT a star 25% off. Saturday, April 6: Half Price Day! 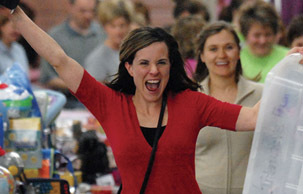 Are you ready for The Central Valley's largest children's and maternity consignment sales event? If you have children, grandchildren or other kiddos in your life, this is one event you cannot afford to miss! Anyone can consign with us and everyone can save. Check out the full sale calendar and please make plans to join us. See you at the sale! Providing other families with really great deals on clothes and shoes. Great deals and I love making extra cash from my kids outgrown stuff. As parents we all know raising kids is expensive! That's why we have a twice a year sales extravaganza to help families save! Kids grow so fast, while most budgets don't. Why not let other families purchase these items they outgrow at reduced costs while you earn cash to buy next season items or that family vacation!